All you had to mention was a collaboration between Torah Bright and Iuna Tinta, and we were in. 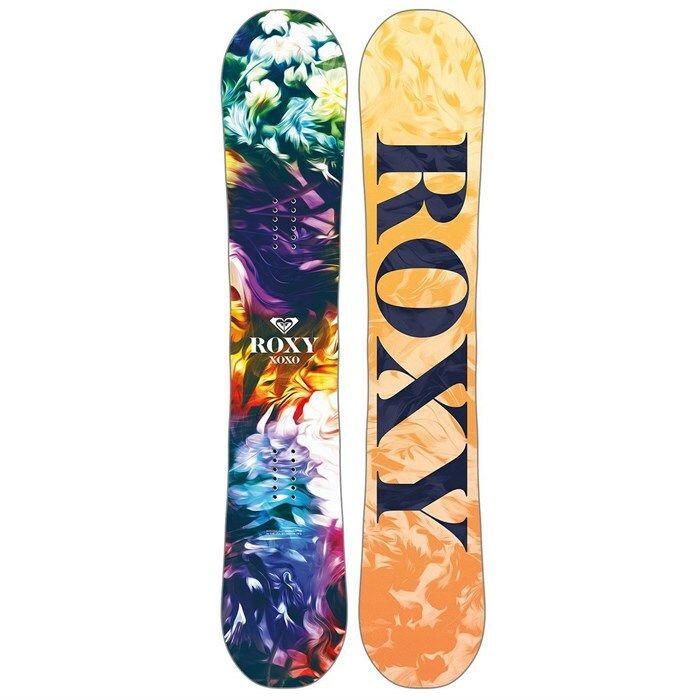 In addition to its rad conception story, the Roxy XOXO BT+ Snowboard features Mervin's Banana Tech Plus. BT+ places inserts of elliptical camber right outside of your bindings that progressively mellows out at the tip and tail for a poppy, floaty feel that's perfect for progressing. Whether you're setting your sights on a podium finish or finally nailing that nose-grab 360. Crafted using environmentally-friendly FSC-certified wood and bolstered with lightweight Silky Smooth Bio Fiber, the XOXO BT+ is the playful, freestyle-inspired evolution of Torah's original namesake board. BT+ (Banana Technology Plus)  Places inserts of elliptical camber right outside your bindings and progressively mellows out at the tip and tail for a poppy, floaty feel that's perfect for progressing. 2 (1 Soft - 10 Stiff)  This snowboard has a soft flex for learning tricks in the park or just learning to link turns. True Twin  A true twin snowboard shape is ideal for riders who want to ride switch. The nose and tail are identical and the flex distributes throughout the entirety of the board. True twins are symmetrical. Kind Hearted Core  The core is the most defining factor of a snowboard. Its shape, type of wood, and contour determine how the board will ride and respond to varying conditions. The Kind Hearted Core consists of kinder, softer wood crafted from fast growing, sustainable farmed timbers that include FSC certified wood. Silky Smooth Bio Fiber  More lightweight than fiberglass, this renewable organic fiber has inherent vibration dampening properties and improved elasticity compared to other fibers commonly used in snowboards. Mervin Made in the USA  For over 30 years, Mervin has always sought better materials and new ways to improve production processes to ensure that the Mervin factory continues to be a healthy workplace that's easy on Mother Nature and their workforce. With Mervin's sustainability practices constantly raising the bar, no other snowboard factory in the world compares. Built with wind and water generated power, and zero hazardous waste.